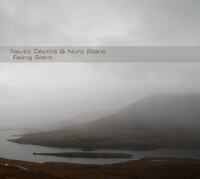 About 2 years in progress, Falling Silent is the first collaboration album by Nautic Depths. It explores sombre and highly intimate sound worlds, maintaining an expressive flow with many embedded details. So far it´s the warmest album by Nautic Depths, with a focus on touching and latent harmonic layers especially in the lower end of the music - you won´t hear any intrusive or ear-piercing sounds on this album. Falling Silent works perfectly for any kind of relaxation and personal reflection, as all music is mixed without interruption between the tracks.